South Korea’s bid to indigenize missile defense will have important ramifications for the U.S.-South Korea relationship. South Korea is going indigenous in its attempt to upgrade its missile defense capabilities. In 2006, the country announced that it would create the Korean Air and Missile Defense System (KAMD), an integrated air-land-sea structure for the detection and destruction of incoming North Korean missiles, including nuclear short-range ballistic missiles. The hardware involved in KAMD currently consists mostly of U.S. and Israeli platforms. 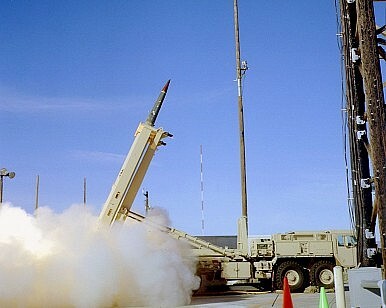 The U.S.-designed Patroit PAC-2 and 3, supported by the Israeli EL/M-2080 Green Pine radar, make up the mainstay of the South Korean land-based anti-missile arsenal. At sea, the Republic of Korea Navy’s (ROKN) Sejeong the Great-class frigates and the Chungmugong Yi Sun-sin-class destroyers are equipped with the U.S. SM-2 Block IIIA/B missiles and AN/SPY-1 radar. That might change. Seoul is set to complement the seaborne SM-2 with an indigenously designed and constructed missile. At the recent Seoul International Aerospace and Defense Exhibition 2015, South Korean company LIG Nex1 stated that the Korean Surface-to-Air Anti-Missile system (K-SAAM) is on track to be deployed to the ROKN by 2018. According to Jane’s, the 2.07 m long K-SAAM employs inertial mid-course guidance and a dual microwave and imaging infrared seeker for terminal guidance. Much of the details surrounding the weapon’s specifications are still classified. The K-SAAM is a medium-range missile designed as a Close-in Weapons System (CIWS). As such, it would act as close protection for the ROKN warships that would be involved in defending South Korea’s coastal cities from attack by North Korean ballistic missiles and aircraft. K-SAAM is set to replace Raytheon’s Rolling Airframe Missile (RAM), the current system operated by the South Korean navy. Another new addition to KAMD is the land-based Cheolmae II surface-to-air missile system. This weapon, which is set to enter service with the South Korean military this year, will provide KAMD with an indigenous land-based ballistic missile killer system and is set to complement the currently operating PAC-2 and 3s. The Cheolmae II has been designed through a cooperative venture between a consortium of South Korean companies (including LIG Nex1 and Samsung Thales) and Russian Almaz-Antey. According to GlobalSecurity, the Cheolmae II has a maximum range of 40 km and can target aircraft and missiles flying at altitudes under 15 km. Once it is launched into air on a piston system, the missile’s rocket motor ignites and the missile is guided by the radar. The missile can change direction quickly and has little chance of being detected by the enemy because it gives off little flares. Equipped with anti-electronic warfare capabilities, the missile system can keep functioning despite electronic jamming maneuvers. The system is set to replace the aging U.S.-built MIM-23 HAWKs currently in service. Seoul’s recent indigenous arms procurement spree has some important political ramifications. Perhaps most crucially, the U.S. wants to deploy its own advanced missile defense system to South Korea, the Terminal High Altitude Area Defense system (THAAD). This has been a deeply divisive issue in the country, with left-leaning elements in Korean politics calling for a definite denial of THAAD’s deployment. A big concern is China’s negative reaction to THAAD’s potential deployment. Beijing fears that the American system might be aimed at China, as much as North Korea. An indigenously produced missile shield could assuage Chinese fears while still providing effective protection against North Korean missiles (although it could upset Washington, which recently signed a missile-defense agreement with Japan). One of these conditions is that South Korea must have the capability to destroy incoming North Korean missiles. While Washington would probably prefer to deploy THAAD, the new South Korean platforms could do the trick. As OPCON is almost equally as divisive as the THAAD-debate in Seoul, the deployment of the K-SAAM, Cheolmae II and Cheolmae 4 will probably be a smart political move for President Park Geun-hye’s government. Furthermore, the U.S. is tired of having to pay for the defense of its rich allies. South Korea will increase its defense spending by over $200 billion over the next five years.